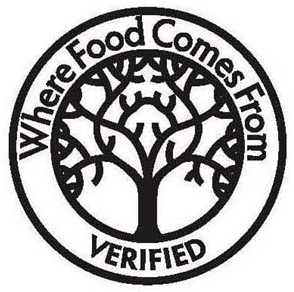 In this opposition to the logo mark shown first below [all wording disclaimed] for food information services, Opposer IMI relied on its alleged common law rights in, and a Supplemental Registration for, the phrase WHERE FOOD COMES FROM, and on a Principal Registration for the second mark shown below for food quality verification services [WHERE FOOD COMES FROM and VERIFIED disclaimed]. The Board found that Opposer had failed to establish acquired distinctiveness in the phrase WHERE FOOD COMES FROM, and further that, given the descriptiveness of the wording, the two design marks at issue are dissimilar. Therefore it dismissed the opposition. Integrated Management Information, Inc. v. Barrie, Opposition No. 91195943 (January 22, 2013) [not precedential]. With regard to Opposer's alleged common law rights and its Supplemental Registration, the question was whether the designation WHERE FOOD COMES FROM had acquired distinctiveness, since it is a highly descriptive phrase. As the Board recently held in Otter Products, a Section 2(d) opposer cannot prevail based on its Supplemental Registration alone; it must prove acquired distinctiveness. The same requirement applies to Opposer's common law claim. The Board concluded that Opposer's evidence failed to establish acquired distinctiveness. The phrase WHERE FOOD COMES FROM is highly descriptive: it immediately informs the consumer of an aspect of opposer's services. Moreover, opposer's revenue and advertising expenses were small and the phrase has been in use for only a limited time. There were no details regarding opposer's use of social media. Consequently, Opposer's Section 2(d) claims based on its alleged common law rights and on its Supplemental Registration were rejected. Turning to Opposer's Principal Registration, the Board found that the two involved marks have "significantly different design elements," and the word portions of Opposer's registered logo is highly descriptive. Those factors outweighed the overlap in customers (the general public) and trade channels. And so the Board dismissed the opposition. Read comments and post your comments here.